Driving in New Jersey is expensive. In fact, it’s the fifth most expensive state to own a car in! Residents of the Garden State – you’re in luck because we’re here to make car ownership more affordable. Metromile is bringing the first and only pay-per-mile car insurance offering to New Jersey, so if you don’t drive much, you likely won’t have to pay much for car insurance. With this revolutionary pricing model, your monthly bill will be determined by the miles you drive each month*. That means that the less you drive, the less you pay. On average, we are saving our low-mileage customers $500 annually. An increasing number of New Jerseyans are choosing to ride bikes, take trains or buses, or even walk instead of drive, so we expect to see a lot of people that will save money with per-mile insurance. Here at Metromile, we like to think of ourselves as the “uninsurance” company, making car ownership easy and affordable for low-mileage drivers. We also alleviate many of the hassles of car ownership with our free smart driving app, which we just totally redesigned and gave a fresh coat of paint. Features include the ability to locate a missing car, view trip details, and decode those pesky check engine lights. The key to all of this is the Metromile Pulse, a device given to all per-mile insurance customers that plugs into the car’s OBD-II port to deliver useful data and insights. New Jersey marks the third state on the East Coast where Metromile’s per-mile insurance is offered, and joins California, Illinois, Washington, Oregon, Virginia and Pennsylvania. 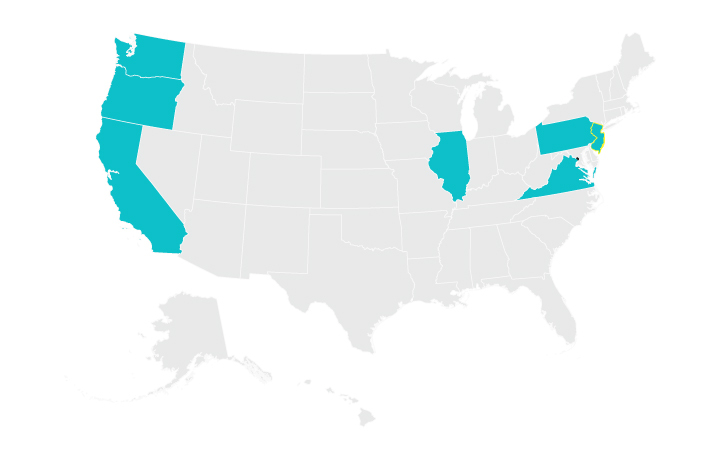 We have more planned for 2016, so sign up for our waitlist to get notified when we arrive in your state! *Insurance rates are determined by driving history and record, car make and model. Mileage does not determine the base rate or per-mile rate.